Day: Tuesday, September 15, 2015 NOTE: this event has already happened, find current-year events on the events page. 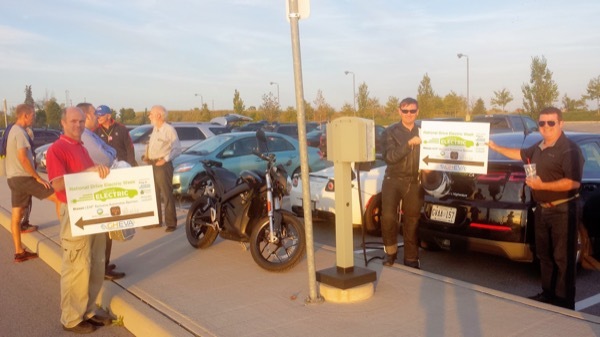 We hosted to events: Niagara EV Wine Media Tour and a Golden Horseshoe Electric Vehicle Association (GHEVA) Event. On the EV Wine tour we had 32 participants and 19 EVs. Federal Member of Parliament and Environment Critic John McKay participated and so did Liberal Candidate Ron Planche from Niagara. The Weather Network cover the Niagara EV Wine Media Tour from Kabaca Vineyards from 6:45 am to 11 am. Other local journalists from Niagara this Week, Autos.ca, Wines of Niagara and the Globe and Mail were also in attendance. Left: Jim Pike, centre Gareth Williams, right: Jaff Stevenson. Vehicles: White Tesla Roadster (Jaff Stevenson), Black Zero Motorcycle (Gareth Williams), Black Chevy Volt Sun Country Highway/ Stephen Bieda. Charging station - Sun Country Highway. During NDEW, GHEVA will be involved/ hosting 2 events. There are currently 10 attendees registered. Registered attendees report 351,500 electric miles driven.